Attend one of Northern England’s most thrilling spectacles as armoured knights engage in full combat on horseback. Witness the drama, pageantry and passion as masterful knights and their trusty steeds battle valiantly to defend their honour, in this gripping 15th Century Jousting Tournament. 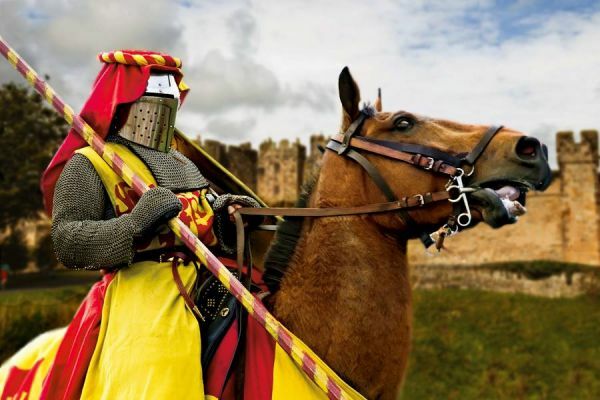 Come and see who will be victorious in Alnwick Castle’s authentic display of chivalry and courage! Learn how to successfully storm one of Northumberland’s finest fortresses (and take siege!) in Reach the Core’s immersive and entertaining demonstrations. Handle historical artillery first hand and experience the sheer ferocity of medieval weaponry. Observe an exceptional display of falconry, combined with enchanting storytelling and inspiring history! Watch in awe as these birds of prey swoop, glide and soar from rampart to roof and discover more about one of England’s more unusual sports. Be thoroughly entertained by the delightful antics of our resident jesters, Zooted. Witness wonderous circus tricks, medieval mischief and slapstick comedy, which is bound to have your sides splitting with uncontrollable glee! Otherwise… It will be off with their heads! This incredible spectacle, between the 3rd and 7th of August, is free with admission to Alnwick Castle!